In "Melt", Stephanie and Garrett take a dish as beloved and familiar as macaroni and cheese and turn it into something positively transcendental. The classic comfort food we all grew up loving is turned upside down, inside out, and made more decadent than I ever imagined it could be. What I love most is that in this beautiful book, recipes such as Pastitsio with Kefalotyri and Lamb can live so harmoniously and unabashedly alongside a comfort food standby like Tuna Noodle Casserole. For ardent mac-and-cheese enthusiasts, look no further than these gorgeous pages!--Ree Drummond, #1 New York Times Bestselling author of "The Pioneer Woman Cooks"
This is a gorgeous, entertaining, and exhaustive resource, with recipes not only for classic mac 'n cheese lovers, but also inventive takes on the theme, from a farfalle pasta salad with asparagus, ricotta salata, lime, and mint to a whole roasted pumpkin stuffed with Fontina, macaroni, and Italian sausage. 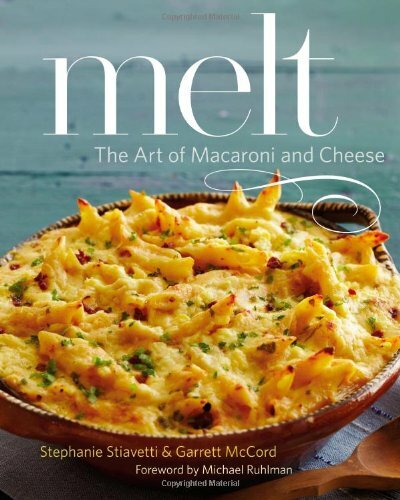 McCord and Stiavetti have redefined the genre.--Molly Wizenberg, founder of Orangette and author of "A Homemade Life"
With "Melt", authors Garrett McCord and Stiavetti Stiavetti take the comforting concept of macaroni and cheese and push it to stratospheric heights. Packed with artfully written, deeply researched information on cheeses across the spectrum -- from the familiar to the exotic -- "Melt "delivers creative recipes that both seduce and inspire. This is one cookbook you'll definitely want on your shelf.--Cheryl Sternman Rule, author of "Ripe: A Fresh, Colorful Approach to Fruits and Vegetables"
Who knew that two household ingredients-pasta and cheese-could inspire such mouthwatering variety? This book is proof that the best kind of culinary ingenuity gives home cooks more choice without added complexity. Easy never tasted so good.--Elaine Khosrova, editor-in-chief of "Culture"", the word on cheese"
""Melt" is a cheese-lover's dream, with creative takes on pasta and cheese pairings of all sorts. . . . Garrett and Stephanie's intention [is] to broaden our minds and tastes, appreciating the classics while taking on new culinary territory. Bravo!" "Elise Bauer, founder of Simply Recipes""
"In "Melt", Stephanie and Garrett take a dish as beloved and familiar as macaroni and cheese and turn it into something positively transcendental. The classic comfort food we all grew up loving is turned upside down, inside out, and made more decadent than I ever imagined it could be. What I love most is that in this beautiful book, recipes such as Pastitsio with Kefalotyri and Lamb can live so harmoniously and unabashedly alongside a comfort food standby like Tuna Noodle Casserole. For ardent mac-and-cheese enthusiasts, look no further than these gorgeous pages!" Ree Drummond, #1 New York Times bestselling author of The Pioneer Woman Cooks"
"With "Melt", authors Garrett McCord and Stiavetti Stiavetti take the comforting concept of macaroni and cheese and push it to stratospheric heights. Packed with artfully written, deeply researched information on cheeses across the spectrum -- from the familiar to the exotic -- "Melt "delivers creative recipes that both seduce and inspire. This is one cookbook you'll definitely want on your shelf." Cheryl Sternman Rule, author of Ripe: A Fresh, Colorful Approach to Fruits and Vegetables"
Perfect for the cheese lover and creative cook. "SimplyRecipes.com""
"In "Melt," Stephanie and Garrett take a dish as beloved and familiar as macaroni and cheese and turn it into something positively transcendental. The classic comfort food we all grew up loving is turned upside down, inside out, and made more decadent than I ever imagined it could be. What I love most is that in this beautiful book, recipes such as Pastitsio with Kefalotyri and Lamb can live so harmoniously and unabashedly alongside a comfort food standby like Tuna Noodle Casserole. For ardent mac-and-cheese enthusiasts, look no further than these gorgeous pages!" Ree Drummond, #1 New York Times bestselling author of The Pioneer Woman Cooks"
Takes an old American standard dish and turns it into something chic and fresh by offering recipes for mac and cheese that incorporate handcrafted artisan cheeses and pastas and by adding surprise ingredients like avocado, lime, fennel, edamame and mint. 20,000 first printing.